Crankbait features, how they affect lure action and indicate when, where and which one you fish. 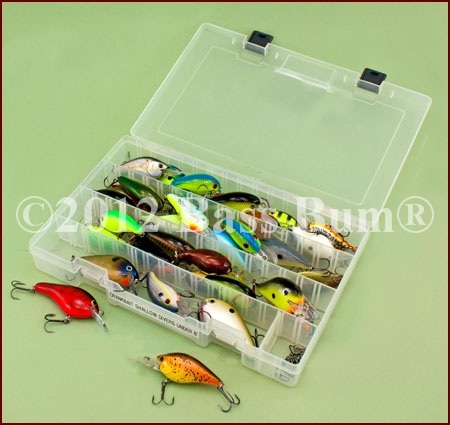 Crankbait lures, sometimes called fishing plugs, can be short, long, flat-sided, round-bodied, have a bill or have no bill, be heavy or light weight and any color imaginable. They're excellent search baits and they flat catch bass when properly used. Do yourself a favor. Learn how to pick the right one for the right conditions then keep a variety in your tackle box. What Is A Crankbait Really? This family of lures is most often characterized by shad shaped lures, generally with hard wood or plastic bodies, that have a "lip or bill" of some size attached to their nose. This lip, which greatly influences the lure's running depth, is the distinguishing feature of "cranks". Running Depth Is Key When Crankbait Fishing. The lip's size, shape and angle are the primary, though not exclusive, design characteristics which determine one of the most important considerations in choosing a crank bait, running depth. Though most anglers think a crank with a steep, sloping lip dives the deepest, it is actually those with lips that extend straight out in front of the body that actually run deeper. Fishing plugs with short, small lips which angle sharply downward from the body are "shallow running", sometimes running no more than 6' deep. Opposite to these are those that have longer, larger lips protruding straight in front of the body and which may run 20' deep or even deeper depending on the model. In addition to depth, the angle in which the bill extends from the body also affects the action of the lure. One that comes straight out of the nose will generate a tighter "wiggle". Bills with a greater downward angle will create a more pronounced side-to-side "wobble". Water disturbance from the bill will be detected by the lateral lines of bass. Depending on their mood a tight wiggle or wide wobble may be their preference so it's important you have an awareness of the affect a crank's bill will have on its action. When a lure bounces off an obstacle such as a rock, log or stump there is often a corresponding "reaction strike" by a bass. The bill of the lure is what enables this to happen without hanging up. Since the bill runs downward in front of the lure's body it tends to run "interference" for the treble hooks. The shape of the bill is very important in "deflection". There are four primary shapes, rounded, semi-rounded and square. The latter is sometimes called a "coffin lip". Square Bills - have a more erratic action as water disturbance from square blades is more turbulent than rounded ones. These lures tend to move erratically "off center" during retrieve as a consequence. 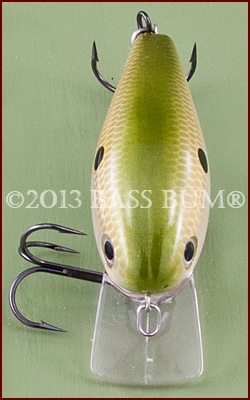 Besides lip configuration the running depth of a crankbait is also impacted by the size line used. Thinner lines have less water resistance so allow for deeper diving. Line that is 10 to 12lb test, for example, is your best choice for casting these lures in open water over flats. If you're around heavy cover, you might go heavier and maybe use a superline. For what it's worth, I use 10lb monofilament line for all my crankbait fishing needs. Monofilament, while a good choice, is always going to have a larger diameter than a corresponding pound test superline. So, superlines, which have much smaller diameter to strength ratios, allow the lure to run deeper by as much as 30% because they have so much less water resistance. When fishing deep water, super line benefit becomes apparent when making long casts. However, if fishing shallow water the benefit of such line over monofilament is negligible. However, there is a distinct disadvantage to superlines when fishing crankbaits - NO STRETCH! Don't forget the stretch factor of monofilament, superlines and fluorocarbon lines when "crankin". Monofilament line has built in "give" as it stretches. This trait contributes to reducing the shock of a strike and when combined with a slower rod gives the bass much more chance to engulf the lure deeper and increase hookups. Furthermore, this minimizes the likelihood of a lure's treble hooks being ripped from its mouth as can happen with superlines and stiff rods. Second only to bill shape and size and the impact they have on running depth is "casting distance". Quite simply, the longer the cast the deeper the dive. What can you do to increase your casting distance? Use as light a line as possible for the conditions you're fishing. Use a long "crankin" rod (over 7') and as aerodynamic a lure as possible. For example, my gear is a 7'4" long, medium-fast Quantum KVD "crankin" rod paired with a Quantum Tour Edition baitcast reel. Research has shown that crankbaits reach their maximum diving depth near the end of your retrieve. This is usually 30' or less from you and just before the lure starts for the surface. This means it's in the maximum depth zone for only a short period of time. It actually reaches more than 50% of its maximum depth within the first 10-20' of your retrieve. The time and distance necessary for your lure to reach max depth means you must cast well past your intended target by at least 40' if you're casting 70-80'. Maximum dive depth is more likely to be reached on 125-150' casts. However, since many crankbaits can not be cast this far on baitcasting gear, because they are large and produce too much wind resistance, or conversely, they are just too light, changing to a spinning outfit will help increase casting distance. Contrary to popular belief, your lure will not dive deeper if you crank it quickly so don't strain yourself by trying to crank as fast as you can. However, you can pick up increased depth equal to the length of rod you shove under water as bass pro Paul Elias popularized. OK, at the start of this page I said cranks were most often considered to be lures with bills or lips. True indeed, but there are other lures without lips which fall in the crank bait family. One of these is the "lipless" version, sometimes called a vibrating plug. 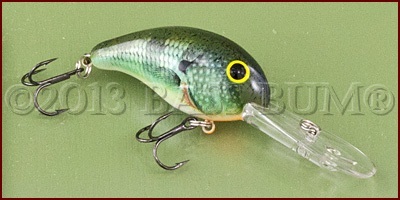 The familiar body shape of a "minnow bait", long and thin with a small lip, could be classified as a crank bait. Many do so classify it. However, there are differences between them. 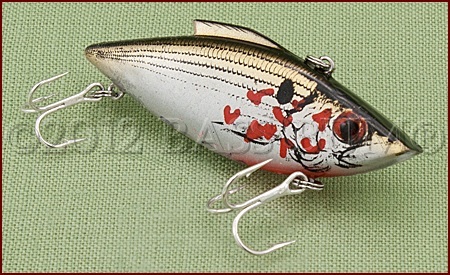 Want to know more about minnow lures? Click here. Lipless Crankbaits? Learn Why These Are "Old Reliable" Bass Catchers. What's The Difference Between A "Crank" And A Minnow Bait?